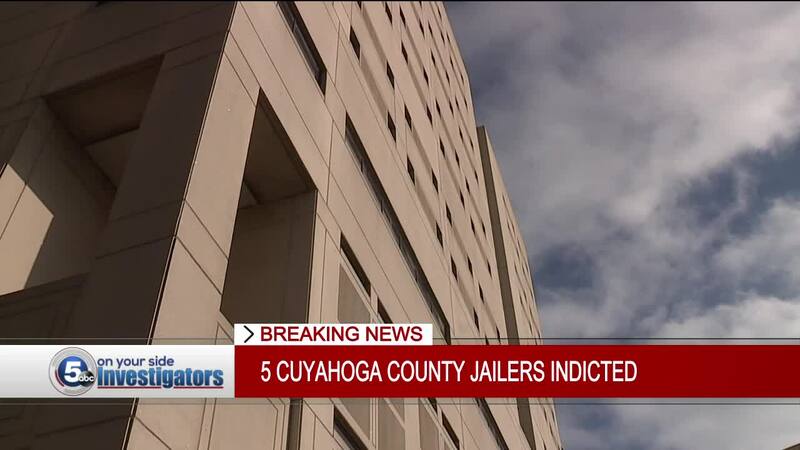 CLEVELAND — Four Cuyahoga County Jail officers who were indicted on various charges , including one corrections officer who was indicted on charges related to the death of an inmate last August, appeared via video for their arraignment Wednesday morning. The fifth Cuyahoga County Jail officer did not show up for his arraignment. Arraignment: Devring pleaded not guilty and the judge set a $5,000 cash surety bond with GPS monitoring. His next court date is scheduled for April 15 at 9 a.m.
Clark was a no-show during the arraignment. Marsh pleaded not guilty and the judge set a $5,000 cash surety bond with GPS monitoring. He is ordered to have no contact with the victim. His next court date is scheduled for April 16 at 9 a.m.
Dugan also pleaded not guilty and the judge set a $5,000 cash surety bond with GPS monitoring. His next court appearance is scheduled for April 17 at 9 a.m.
Evans also pleaded not guilty and the judge set a $5,000 cash surety bond with GPS monitoring. His next court date is scheduled for April 17 at 9 a.m.